I may have mentioned that I draw all of the Cat-of-the-Day drawings on my Samsung phone… and I may have mentioned that I loved the phone so much I recently bought a Samsung tablet that has the same pointy little stylus that I draw with but a much bigger screen (people ask me what software I use – it’s not the software, it’s the hardware that’s important). However, just now I am drawing with the phone, because this is the bag in which the tablet lives. It is a valuable tool, and it is being closely guarded. 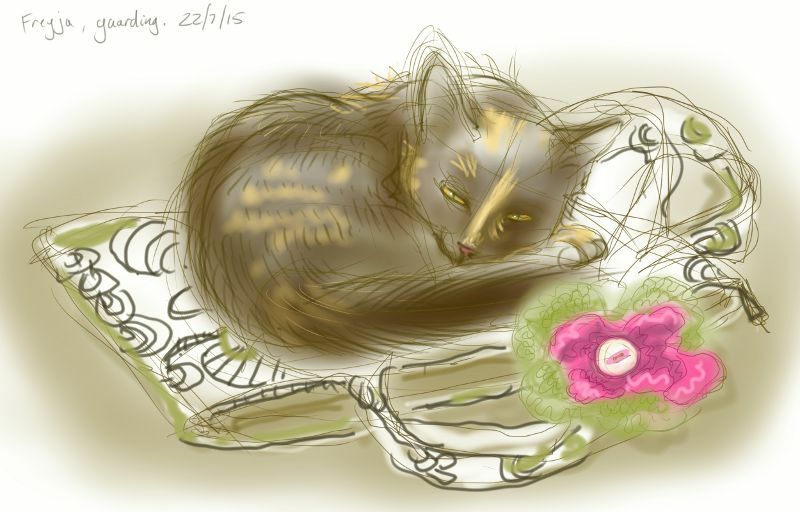 This entry was posted in Cats, Uncategorized and tagged art, cat guarding, cat sleeping, cat-of-the-day, digital sketch, drawing, Freyja Kitten, illustration, sketch on July 22, 2015 by Nancy Farmer.